Washington DC – A new study shows that climate change presents a heightened threat for snow leopards in the Himalaya Mountains, according to conservation group World Wildlife Fund. The study, carried out by WWF scientists and published in the June, 2012 issue of Biological Conservation, shows that if greenhouse gas emissions continue to increase steadily, 30 percent of snow leopard habitat in the Himalayas may be lost to treeline shift. Snow leopards, an endangered species with a remaining population roughly estimated to be between 4,000 and 6,500 individuals, are sparsely distributed in the mountains of northern and central Asia, including part of the Himalaya Mountains. In the Himalayas, snow leopards live in high alpine areas, above the treeline and generally below 5,000 meters, where they are able to stealthily track their prey. According to the study, warmer and wetter conditions in the Himalayas will likely result in forests ascending into alpine areas, the snow leopards’ preferred habitat. “We know that snow leopards rarely venture into forested areas, and there’s a limit to how high these animals can ascend. If the treeline shifts upward, as our research predicts it will, we’re looking at the snow leopard faced with diminishing options for where it can live,” said Jessica Forrest, a WWF scientist and one the study’s authors. The study used both computer modeling and on-the-ground tracking efforts in high elevation areas, and modeled the impacts of various warming scenarios on the Himalayan portion of the snow leopard range. Warming at high elevations in the Himalayas is occurring at rates higher than the global average. The researchers first used field-based data and environmental information such as land cover, terrain ruggedness, and elevation to map current snow leopard habitat. They then used statistical methods to look at the potential impact of climate change on the Himalayan treeline under three greenhouse gas emissions scenarios available from the Intergovernmental Panel on Climate Change (IPCC). The IPCC projects temperatures in the region to increase by 3-4 degrees Celsius by the end of the century, accompanied by an increase in annual precipitation. Researchers identified areas that are likely to remain resilient to the effects of climate change, and would thus provide habitat to snow leopards under future climate conditions. Many of these areas span national boundaries, emphasizing the need for transboundary cooperation to protect this rare species. Researchers also emphasized the need to minimize pervasive threats like illegal hunting, human-wildlife conflict, and overgrazing of livestock in snow leopard habitat. Minimizing these concurrent threats will help snow leopards better deal with the additional stress of losing habitat to climate change. “Loss of alpine habitat not only means less room for snow leopards, but also has the potential to bring them closer to human activities like livestock grazing. 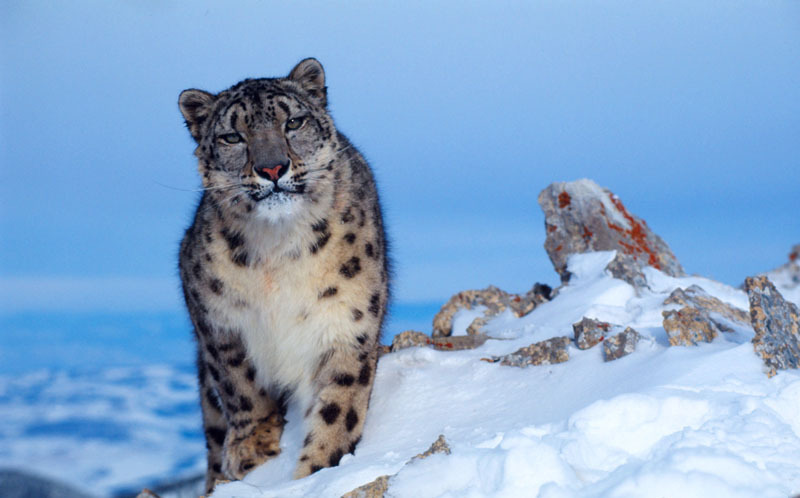 As grazing intensifies and the leopards’ natural prey decline, they could begin preying more heavily on livestock, resulting in increased retaliatory killings,” said WWF snow leopard expert and study co-author Dr. Rinjan Shrestha. As part of their findings, researchers also recommended monitoring the impacts of climate change as they evolve, and adapting management strategies accordingly.